I went for lunch at Shirley’s Bayside Grille and tried out the patio. 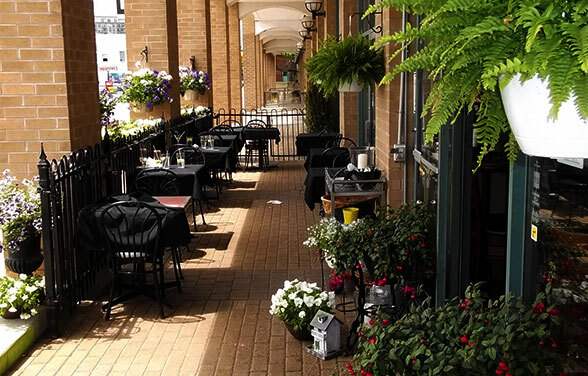 On a hot day, the patio is perfectly tucked away from the sun, decorated with beautiful flowers with a scenic view of Kempenfelt Bay. Shirley’s has a full lunch menu as well as a Dinner menu in the evening. 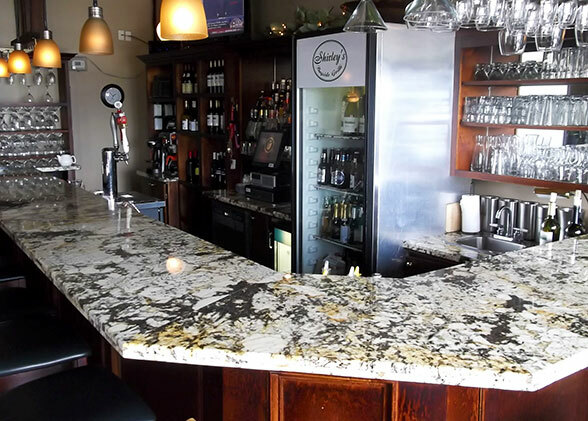 Shirley’s was priced as expected for a classier restaurant in downtown Barrie. When the food was served and I had the chance to try it, me and my friends were all pleased and felt the quality of meals and portion sizes were quite exceptional. The most typical dish we tried was the club sandwich, so I’ll say that it was priced at $13.00, which isn’t unusual or terrible and almost on par with what you’d pay for a sandwich at Subway or Quiznos. 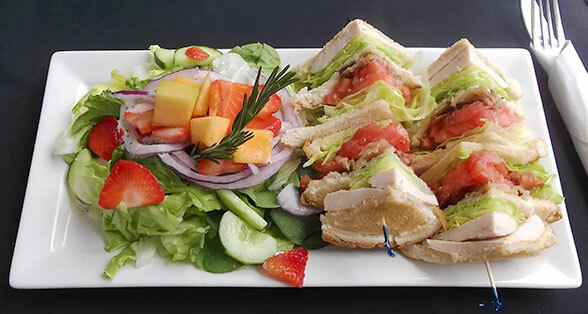 The sandwich was delicious and came with a wonderful salad that had melon and strawberries. The restaurant also had a couple pizza dishes on the menu. There was a smoked salmon dish and a large selection of salads to fill out the lunch menu. To me, I much preferred the Caesar salad that came with both the baked chicken wrap and grilled sirloin steak. The quality of salad was far superior to many Caesar salads I’ve tried at large chain restaurants. The dressing was delicious and the large chunks of bacon really made these two dishes come alive. You just don’t get quality like that at a sub shop or on the giant salad bowls you get at East Side Mario’s. As a side-note, The Eggless Caesar Salad at Shirley’s is priced at $11.00. I’m very glad I tried the Sirloin 6oz. Steak. It was priced at $15.00 and was the most expensive dish we tried. 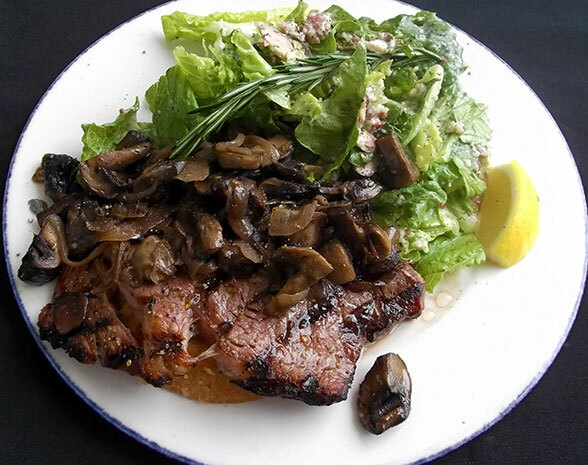 It came with grilled mushrooms and caramelized onions which were a very tasty addition. I really love going to a place like Shirley for a change, because I’m always afraid of the prices, but in reality Shirley’s Bayside Grille is a nicer place to spend your afternoon than any of the in and out sandwich shops but really has prices that are about equal anyway. If you’re with a group, the variety on the menu just adds to its appeal. The atmosphere and service at Shirley’s was as expected. The waitresses were friendly, the food came quick and cooked perfectly. The music weather and tables were all great too. I can see why Shirley’s has been in that spot along Dunlop Street for over 15 years. It was very busy inside the restaurant as well. If anything, the interior eating area seemed like a nicer atmosphere than the patio. But I guess I’ll have to try the main seating area for dinner one night. Also, Shirley’s Bayside Grille is featuring live music on Wednesday nights if you’re looking to go out for a relaxing and lounge-like setting sometime. I don’t think it gets as rowdy as some of the bars and pubs the rest of downtown Barrie has to offer, but I can’t say for sure. Check it out! It’s a great lunch spot in Downtown Barrie.